If you’ve been following along on Instagram, then you might have noticed that I’m diving into my main passion, interior design. So, what better way to start off the new year than talking about the top five interior design trends for 2019? We’ve all heard trends will come and go, but if there’s one thing I learned, it’s that most good trends will never really go anywhere, they're just re-invented for the current present. Chances are, you’ll see the same trend peak at least once or twice throughout your life. Talk about something that makes you feel old. I think sometimes the word trend can have a bad stigma around it. You might think of trendy items as something you’ll be sick of in a couple of years. And while this is true, especially when it comes to interior design, I think there are ways to make trends work for timeless look…or whatever your aesthetic is. Let’s look at the top five interior design trends I’m loving for 2019! I’ve seen this trend pop up in home accessories, furniture, and in entire rooms over the past couple of years, and it’s coming back with a bang in 2019. If you’re unfamiliar with terrazzo, its a mixture of concrete combined with small pieces of marble, granite, quartz, or glass (typically recycled). They’re cast together in almost any shape imaginable, which makes it perfect for large areas and unique shapes. The result looks very similar to a mosaic, but there is no specific design to the pieces. I think we’ll see this trend make its way all over pinterest and instagram in the next few years, and there are a couple of reasons why. It can make big statements or subtle ones in all types of interior spaces, thanks to the variety of ways this material can be used. I also love this trend because the options are nearly endless! Not only can get terrazzo with chips in an array of colors and sizes, but you can also tint the concrete color itself, which makes it perfect for matching those tricky color palettes. The first thing that pops into my head when I hear this trend are those circular beds from the ’70s. Well, this trend isn’t too far from that. In 2019, we’re seeing more curvy furniture show up in the living room, in the form of chairs, sofas, and accents. I love this curvy trend for two different reasons. One is that there are so many ways to pull off this look. You can make it a statement piece of the room, or use it as a subtle accent. For example, a curved sofa can make a major statement in a room, but an armchair with similar curved features doesn’t feel so daunting. The second reason I love this trend is that it works well for small spaces! Did you see this one coming? If your space is small, this trend might just be the trick you need to solve your space planning problems. 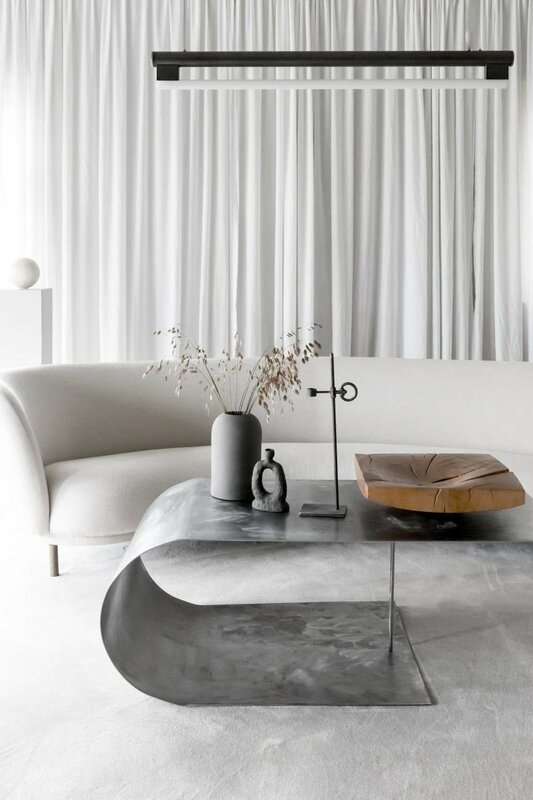 A curved piece of furniture, like a sofa or armchair, creates a little more useable space around it since you’re not confined to the hard lines of a rectangle or square. The curved lines on furniture can make the room feel more feminine. 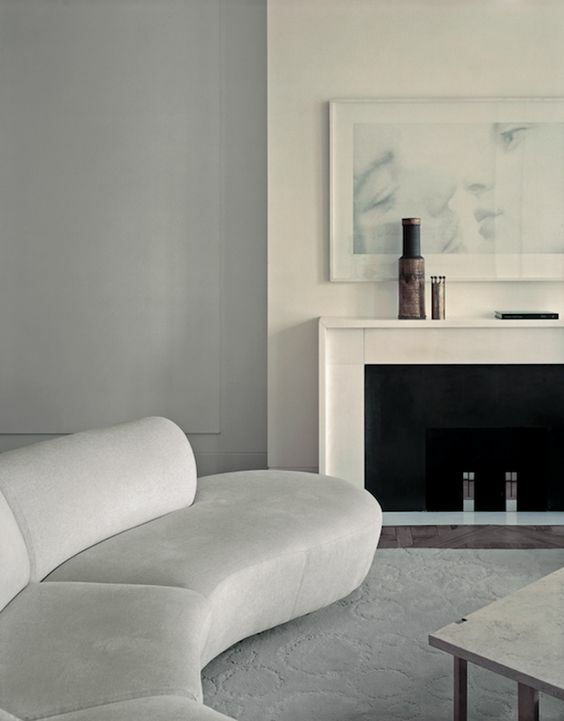 For a timeless and contemporary look, mix both hard and soft lines throughout the space. Did this trend even go anywhere? I don’t know if it’s just my personal love of black, or if I’m aging myself because I may have already lived through this trend, but I don’t think this trend is new this year at all. To me, black is a neutral, so it’s hard for me to see this trend fading away anytime soon. I’ve been in love with black walls and kitchens for as long as I can remember. When I was 18, I saw a photo of a black bedroom on an interior design website, and without another thought, I painted my apartment walls black for the first time….. against the landlord’s wishes. And it was one of my favorite wall colors of all time. There’s this myth that black walls can make a room feel smaller. But, in my opinion, nothing is further from the truth. Like any dark wall color, it adds a certain level of warmth and coziness, but it’s so important to balance it out by adding lighter colors and other tiny pops of black. Tone-on-tone decorating is where you choose one color for the room and decorate around that, strictly decorating in the same tone. I think these rooms have a beautiful sophistication about them and since I’m not one for a lot of different colors, there’s a special place in my heart for this trend. While you might think this approach to decorating would be easy because you’re only dealing with one color, it can be very tricky. When it comes to matching everything, it can be difficult to find that perfect tone, as you’ll quickly find that colors can differ quite a bit from brand to brand. One cream or ivory fabric will look lightyears different than other brands. In my opinion, this look takes a strategic eye and a lot of patience. If you’re looking to achieve this look in your own space, I would suggest choosing your paint color and large pieces of furniture first, like the sofa. Then while you’re finding accessories for the rest of the room, you’ll have a paint and fabric swatch to reference. Wood-paneled walls and statement ceilings can create that wow factor in any room. There’s nothing I love more than a beautiful wood-paneled wall or coffered ceiling. Since it requires special craftsmanship to perfect this look, there’s an unparalleled luxury about it, and it can instantly make a room feel more sophisticated. I’m seeing this trend pop up more and more and even a few DIY’s, too! I think that this trend can easily be incorporated into any space. There are so many ways to go about this look and it can be designed to match any type of aesthetic. From modern and minimal to a more traditional feel, this trend is popping up in all types of spaces on Pinterest and Instagram! Those are the top five interior design trends of 2019 that I’m loving right now. I can’t wait to design some interiors using a few of these trends! What are your thoughts about these trends? Do you even consider these trends to be trendy? I’d love to know your thoughts in the comments section below! If you’re looking for more inspiration, be sure to check out our pinterest page for more!